Gardner Books is a UK based book and ebook distributor as well as, via Gardner Hive, the UK partner for Google Books. For some time now they've been wanting to make a deeper mark on the ebook market and yesterday we got to see their first effort. And it's a curious little beast. 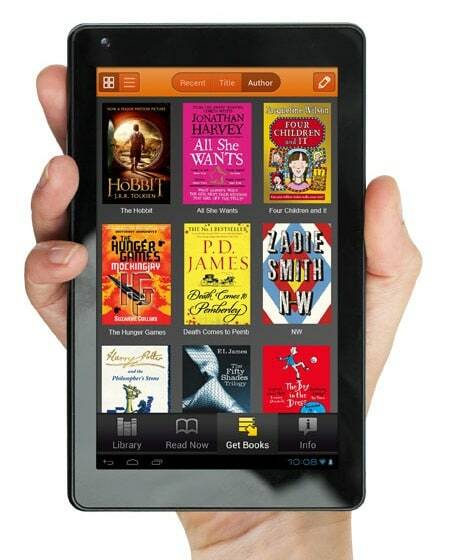 While one might think an ebook distributor would announce an ereader, Gardner is instead launching an Android tablet. The Gardner GoTab has a 6" (800x480) screen with a capacitive touchscreen. It's running a reasonably current version of Android 4.0 ICS on a 1GHz CPU with a Mali graphic chip, Wifi(n), a g-sensor, 4GB Flash, a microSD card slot, and a VGA webcam. Gardner Books is supporting the GoTab with Hive Reader, an app which ties in to the Gardner Hive ebookstore. But since this is an authorized Android tablet it should also support any of the other reading apps found in Google Play. Gardner is calling it an ebook reader, which is itself an interesting detail. I'm not saying they're wrong so much as wondering if the definition has shifted. I mean, the GoTab comes with Google Play and complete support for Android apps. It even has decent specs for the bottom of the barrel Android tablet niche. But while cheap tablet like the GoTab do make decent ereaders I would never call them that. It's due out in October for a startling price of £59. That translates to roughly $95, and once you deduct the VAT which is built into the price you end up with the cheapest Android tablet on either the US or European markets. While that is an impressive achievement it could also be a sign that too many corners were cut on this device. Take the battery life, for example. The GoTab is specced for only 4 hours of web browsing. That's not a lot, and it's a sign that this design skimped on the battery. My first $80 Android tablet was a terrible device to use and this one might be as bad. But that remains to be seen. Well, the battery life of 4 hours internet browsing is one cut corner for sure. The size is nice though, so commuters might not care. I’m not sure they could have found a higher resolution screen – not in a 6″ size, anyway. It’s not that common. They’ll go bankrupt from all the returns. If the craptab lasts for six months, it’ll be a miracle. Cheap Chinese tablets lack QC and that’s why they’re cheap.